This is a plug for my colleague Thierry Chavant. We are working in the same advertising agency. 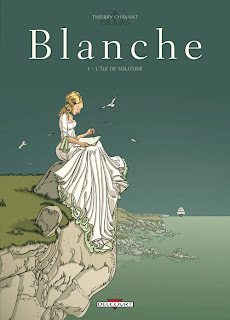 Just like me, Thierry turns into a comicker when the night comes, and he has just completed "Blanche", a wonderful graphic novel coming out next month. hé ! merci Herval ! je suis très honoré que tu me fasses une pub pareille, surtout venant d'un talent comme toi !!! Hello. I read that you work in an ad agency full time and comics by night? wow! Thats hard work. I did it for a while too. I thought you did comics and illustration full time. Your work is marvelous I wish you did it full time so we could all see more and more of your beautiful art. I have been a fan of your work for a long while now. It is fantastic. And this plug for your colleague looks great too. Craig > Thanks a lot. To say the truth, I don't work full time in the ad agency anymore. Just half time, since a few years. Other half is for freelance illustration and comics, but I still need to work by nights and weekends to have all the work done !